NETWORK FINALS: BONES and the MODERN FAMILY rerun gained 0.1 in final numbers. CABLE HIGHLIGHTS: With the broadcast season over, the NBA PLAYOFFS towered even higher over the landscape, this time with TNT earning 3.99 for the Golden State vs. Oklahoma City game. Hockey followed, with 0.89 for NBC Sports Net’s NHL PLAYOFFS game. USA’s WWE completed the sports trifecta, down 0.11 from last week to 0.59. (Farther down the list, Univision’s LIG soccer match was at 0.40, and ESPN’s coverage of the NATIONAL SPELLING BEE was at 0.28.) A&E aired a 60 DAYS IN REUNION SPECIAL at 0.58, compared to 0.84 for last week’s regular episode, and lead-in THE FIRST 48 fell 0.08 to 0.35. History’s ALONE declined 0.04 to 0.43, and MOUNTAIN MEN ticked down to 0.39, with 2 episodes of JOIN OR DIE at 0.15/0.09 compared to last week’s 0.13/0.08. 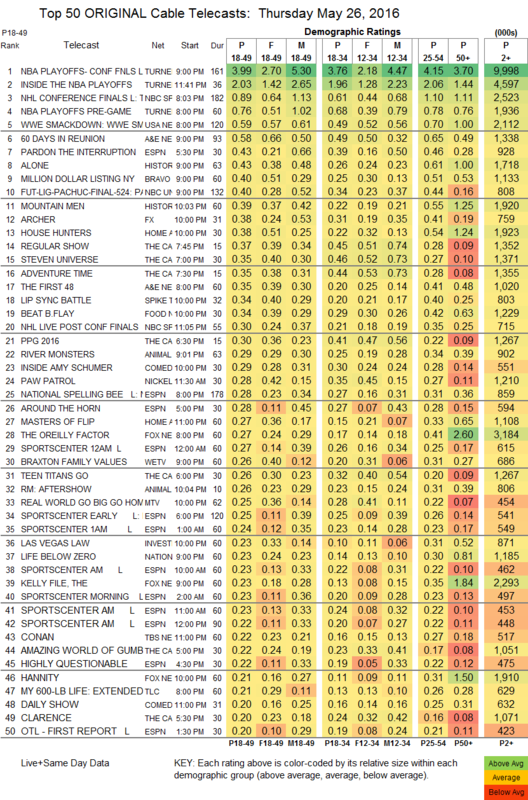 Bravo’s MILLION DOLLAR LISTING rose 0.04 to 0.40, and PEOPLE’S COUCH was steady at 0.18. FX’s ARCHER slipped 0.01 to 0.38. HGTV’s HOUSE HUNTERS was down 0.06 to 0.38, and MASTERS OF FLIP was off by 0.08 to 0.27. Spike’s LIP SYNC BATTLE fell 0.09 to 0.34. Food Network’s BEAT BOBBY FLAY was up 0.02 to 0.34. Comedy Central’s INSIDE AMY SCHUMER gained 0.02 to 0.29. We’s BRAXTON FAMILY VALUES took a 0.12 hit to 0.26, and MATCH MADE IN HEAVEN was down 0.04 to 0.17. MTV’s THE REAL WORLD rose 0.04 to 0.25, and another hour at 11PM was at 0.20. Tru’s COMEDY KNOCKOUT stayed at 0.12. 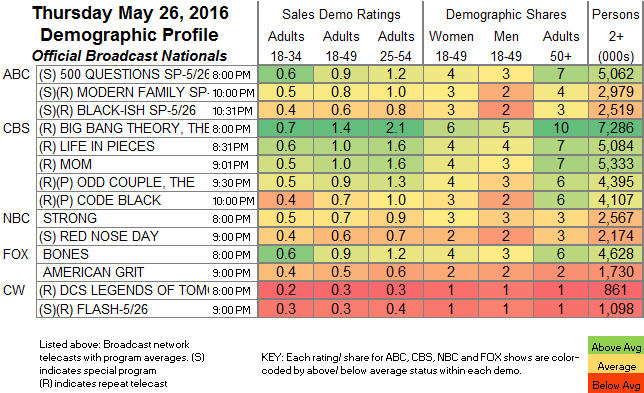 On BBCAmerica, ORPHAN BLACK remained at 0.10, and AFTER THE BLACK was down a tick to 0.15/111K. Showtime’s SUBMISSION inched up 0.01 to 0.03/119K.